Winter enthusiasts are not only waxing their skies for the season, but they’re also checking climate data too or at least Michael Pidwirny is. Pidwirny, an associate professor in the Department of Earth, Environmental and Geographical Sciences at UBCO, visited TRU last week to speak about some of his research in climate data. In the hour-long presentation, Pidwirny spoke to his audience on data he and his graduate students have been collecting over the years on climate change and the effects it has had and will have on ski resorts on the west coast of North America. Pidwirny came prepared with graphs that showed data on snowfall and climate change on ski resorts such as Whistler and Sun Peaks form as far back as 1901 to 2017, showing averages for each year. 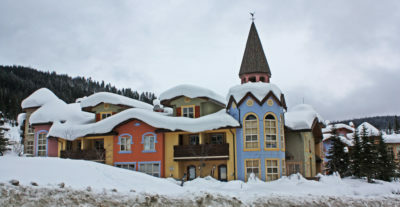 This data not only allowed Pidwirny and his students to look at trends of the past, but it also gave a glance into what the future may hold for these resorts. “I’m going to be showing you the worst case scenario. I think it’s important to stress that because we really aren’t doing anything to reduce climate change in the future,” Pidwirny commented during his presentation before showing predictions for the future. Pidwirny used the ClimateBC software and enormous database to collect his research, using virtual weather stations to collect information on average temperatures, precipitation and snowfall levels. From previous trends collected, Pidwirny had predictions of future temperatures on ski hills and snowfall levels all the way to 2070 and even 2100. The inspiration for collecting this information is because Pidwirny is a skier himself and he wanted to know what his personal favourite mountain, Big White, would look like in the future. “By 2055, that temperature of -2 celsius will be the average temperature of the ski resort,” Pidwirny said about Whistler, comparing these future temperatures to the particularly warm year that the mountain faced in 2015. While Pidwirny joked around that he didn’t want to reveal damaging information to the media on account of his funding, he stressed that there would be economic impacts if temperatures continued to rise and snow levels continued to drop over the years. This was revisited after the presentation during a brief question and answer period, where an audience member compared this data to the length of an average mortgage for a property on a ski resort. Pidwirny ended his presentation candidly, saying that changes were coming to these major ski resorts one way or another, whether it is a change to seasonal memberships or more full out closures like in 2015.